It's already been a busy month with all sorts of info about the Tribes coming out, but we're not done yet! Read on, fair traveler, and hear this story that you've become a part of. In case you missed the last Q&A, hereby known as Tribes Q&A: Part I, you can still watch it in its entirety on our Twitch.tv channel (with the chat that was happening at the time) for another couple weeks. As always, you can see it on our YouTube channel forever after, though sadly without the witty banter from chat. Now say you don't have a couple hours to spare, or you'd like to send it to a friend who's less savvy to Elyrian ways than you, we've got our Tribes: Part I In Brief version as well. No matter which way you like your information, we've got you covered! Originally announced in this post, we realized that a single Q&A about the Tribes just wasn't going to cut it. We're now going to do 4 Q&As in total over the next few weeks in hopes that we can inundate your brain with so much information! The next Q&A, Tribes: Part II, will occur next Monday, June 19th, at 1PM PDT / 4PM EDT / 8PM GMT / 8PM UTC. We're currently getting the Kypiq, Janoa, and Dras dossiers written up, but questions about the Neran, Hrothi, and Brudvir are still welcome. The remaining Tribe Q&As will take place on July 10th and 24th at the same time of day. Each Q&A will get its own question thread where you can up and down vote the questions you'd like to have answered by Caspian and friends. We hope to see you there! And now for the continuing adventures of this intrepid team! The Build Hellions have concluded their duties for the time being and returned to their other duties. Ever vigilant, they will take up the robes and artifacts of their mysterious order when the next Unreal beast reawakens to propagate the world with its gifts. The new ritual they developed will ward against chaos when the creature returns. While the Anthropology Department awaits the Tribe Foundry's results, there has been a moment of reprieve for this group to address several tasks that will help in future efforts in working on all the permutations of tribe and gender. Firstly, Irreverent was able to establish guidelines for the tribes' varied equipment and is reconstructing several items that fit with the new skeletal data that Strider developed. This involved Vanimus Prime working closely with Strider to get the skin weighting, UVs, textures, and control rig linked between all male and female assets. There was also an erroneous hypothesis (read: bug) about the Neran tribe becoming unpigmented when not in direct sunlight that was, thankfully, disproven. The Zoology Department is hard at work on an upcoming exhibit of Elyrian fauna that will feature in a future blog post. There were a couple of hiccups finishing off the comprehensive study of Dryas Elk and horse gaits during the last couple weeks, but Racronos got things back on track so he and Mudokon could continue to work unfettered. Meanwhile, the Trison and Ursaphant are nearing the culmination of their explorations, and the Canis Rabbit has been adjusted and is ready for its own movement study. The adorable Otter Bear is still being modeled, with the base geometry nearing completion before tackling its texture and hair. 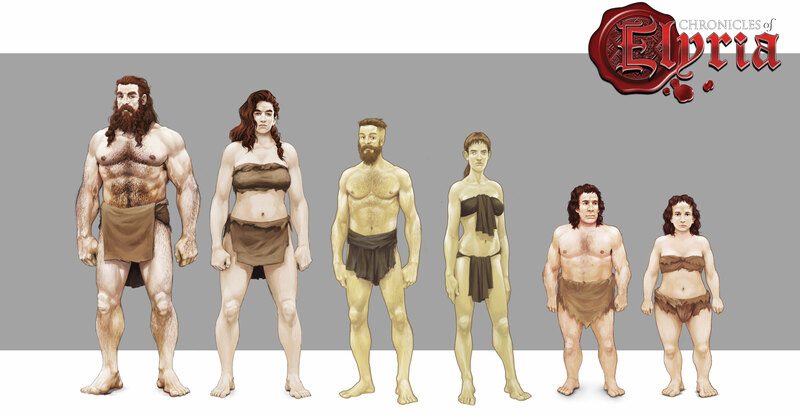 After seeing the efforts the Anthropology Department and Tribe Foundry put forth, the Zoology Department developed its own height line-up for creature sizes. As far as the explorations of Titan's Steppe ecology, a couple of steps forward are happening. Wiz created an atlas function that will optimize draw calls and reduce visual noise, particularly on tiled textures at various levels of details. Some of you may be familiar with the term mipmapping, and this is related to that. With that done, Wiz is working on his opus: to standardize each material in Elyria. He will be enlisting Irreverent and Vanimus Prime later on, but is currently focused on each layer in the landscape, which is Raevantiel's domain. And in case you were wondering, the landscape is made up of layers that include ground, soil, ground cover (think pine needles or moss), grass, riverbeds, foliage, and trees. Their current efforts are with the soil. The Blue Penstemon and Astrantia Snow Star are beginning to bloom on the Steppe - and check out that updated grass! This party's quest is nearly at an end. I hope, by now, you have seen the posts detailing out the first few tribes: the Neran, Hrothi, and Brudvir. If not, go take a gander and join the conversation about the tribes! The remaining tribes are being revealed over the next few weeks so check here to easily see when new dossiers are released. We also announce these sorts of things on our Twitter account, so consider following us, if you haven't already. As you may recall, this party has been hard at work to marry the server data with a front-end that is interactive. Previously, they were focused on making certain that the underlying data was being handled and displayed, but that part of their quest did not demand much in the way of interactivity. Loading levels and player state and location and the like are in. Now, with a good foundation established, efforts are turning toward the playable parts. 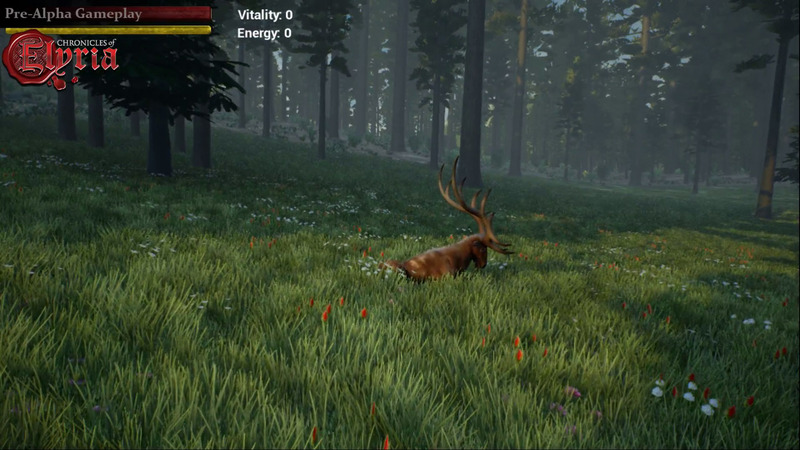 This includes entity controllers that will manage creatures and NPCs moving around in a persistent world, ElyriaMUD's brand of basic combat, and the ability to pick up and equip items found in the persistent world. Once that's in, this party wants to do a demonstration video to take you through a first taste of ElyriaMUD. This party continues to march forward on the V3 design of the website. 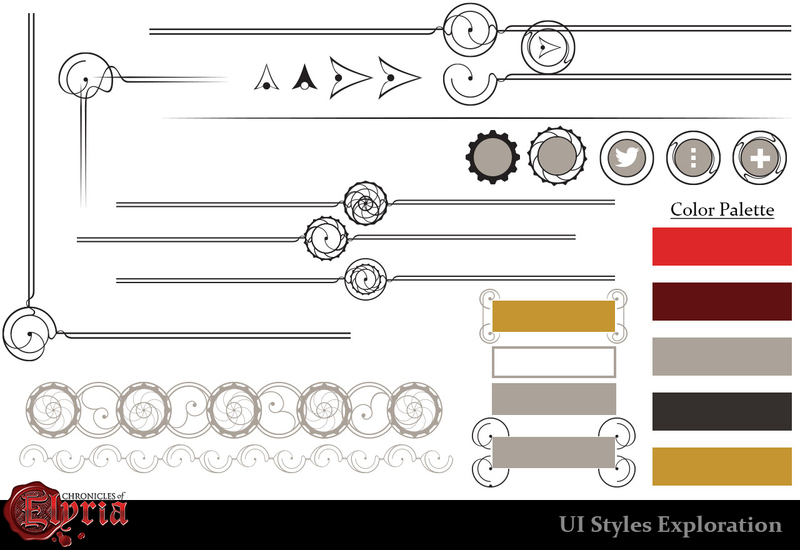 Scarlet is now creating graphics based on Death's wireframes and ZRO will begin on the front-end starting next week. In the last couple weeks, there have also been a handful of bug fixes, improvements for Serpentius and his team of moderators to better manage the community, and a better organization for the server-specific forums. The information in the Tribe posts are also being worked into Game Guide pages to help newcomers discover the wonderful world of Elyria! In order to spend more time with the Order of the Online Play and the League of Extraordinary Locomotion, Tripnull ended his current contract with the Proto-Tailors, feeling confident that he had transferred all his knowledge to Sekmu on the matter. The party was waylaid on its path to character generation by the skin weighting, UVs, and control rig updates that the Society of Elyrian Ecology made so Irreverent and Sekmu have cleverly been working orthogonally on the related tasks of updating existing equipment models to work with the updated morph targets and getting the equipment to propagate on the client over the server. Additionally, Heat entered the mix to provide concepts of Neran-style equipment that will serve to guide the party in fleshing out the specifications for crafting. 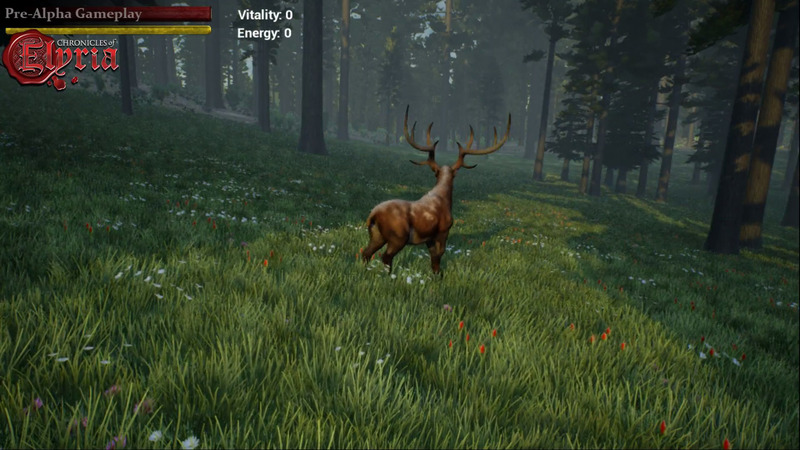 You already saw the Dryas Elk gif earlier in the post, demonstrating this party's work in getting the locomotion system adapted to one of the quadruped rigs. Strider has also finished up the last of the crouch-related locomotion animations including a slide for those times you need to stop in a hurry. There is one major outstanding task before this party can consider their quest at an end, however: tuning the jump height and length. Kaizen is putting together a video demonstration of the League's accomplishments that we will be putting up on our YouTube channel. This party has lovingly crafted a first draft of the visual style that represents Chronicles of Elyria. As mentioned in the last update, the style will be used on the V3 version of the website as well as the UI in the final game. Scarlet and Heat went back and forth several times before arriving at something that had the right mix of ornate, organic, and structured elements. This party will, no doubt, reunite in the future on further adventures but, for now, their current quest has ended. Here's a sneak peek at this first pass! Kaizen is the name of the Japanese philosophy for continuous improvement. It's a philosophy that Soulbound Studios can certainly appreciate and now it's also a person that you can appreciate! Give a warm welcome to the newest member of the team, Senior Community Producer, Adam "Kaizen" Wong. Some know me as Adam, but the more learned circles call me Kaizen (also it’s helpful because there’s already an Adam at the studio). It’s been just over a week since I joined the ranks of Soulbound Studios as a Senior Community Producer. What’s a Community Producer, you ask? Chronicles of Elyria is going to tell a compelling story. The lore, the gameplay design, the art – all the facets of the game are interesting in their own way. Layer the growing community on top of a deep and engaging game, and now we’re cooking with fire. The way I see it, my job is to help tell that story – from entertaining GIFs (it’s pronounced Jif like the peanut butter btw) to developer diaries to gameplay sneak-peeks to dank memes to Twitch broadcasts to amplifying betrayal found in the Dance of Dynasties, I’m here to foster, facilitate and encourage conversation about CoE. I’m a pretty social person, you’ll find me hanging around the Twitch chat and Discord. If you want to chat about anything and everything, drop me a line on Twitter. Or! I’ll be on Discord, so stop by and let’s get to know each other. What was I doing before working on Chronicles of Elyria? I spent some time with 343 Industries, working on Halo (I never got my 50 when H2 was hot). I worked at Bungie and helped ship Rise of Iron (Titan hammers for days). I also worked at Amazon Game Studios, helping them build a community from the ground up (FeelsBauMan). We’re all on this journey together, and I’m excited to see where the road leads. I think he will fit right in, don't you? Look for more community coverage by Serpentius and Kaizen (hereby known as the Adams Family) in the coming weeks. That's it for this update but there are tribe dossiers and more coming your way soon so check back often! Keep up the hard work. I have seen what you guys have done so far and it looks amazing. I already know wich tribe to play even. Not telling (hrothi) blacksmithing ftw!! This looks amazing! I'm getting so excited for the release! Idk how much longer I can wait. Keep up the good work Soulbound, the game looks awesome, while I would seriously doubt the game launches even alpha this year I will happily keep watch on it and be ready to play the day it is live. I really want to play this!!!! Whoa, a ton of new members here. First of all, welcome to the forums! You're all in luck. I've been hearing that we're getting a large update with an updated development timeline after the last of the tribes have been revealed. For those asking about tangible progress here is a video showing some progress on the playable prologue, posted two months ago. Posted By **Kuec** at 8:53 PM - Sun Jun 18 2017 > > I can't wait to play this game! Posted By **Enthrial** at 8:47 PM - Tue Jun 20 2017 > > I really want to play this!!!! Posted By **Yanos** at 06:43 AM - Thu Jun 22 2017 > > Why we never get answers for our questions? > All we are getting is, that work is hard, full steam and so on... > I can't wait myself to play this game and I've started worrying, that we may end up empty handed. There was many great projects on Kickstarter, that are no more in existence :/ > So Soulband, please give as proper answers, not just a crap, of how hard you are working on different skin patterns Posted By **Ragesangel ** at 4:20 PM - Sun Jun 25 2017 > > Keep up the good work Soulbound, the game looks awesome, while I would seriously doubt the game launches even alpha this year I will happily keep watch on it and be ready to play the day it is live. Whoa, a ton of new members here. First of all, welcome to the forums! You're all in luck. I've been hearing that we're getting a large update with an updated development timeline after the last of the tribes have been revealed. For those asking about tangible progress [here is a video showing some progress on the playable prologue](https://www.youtube.com/watch?v=xi2ASn9xDB0), posted two months ago. If you read the forums answers have been given. Posted By **Yanos** at 2:43 PM - Thu Jun 22 2017 > > Why we never get answers for our questions? > All we are getting is, that work is hard, full steam and so on... > I can't wait myself to play this game and I've started worrying, that we may end up empty handed. There was many great projects on Kickstarter, that are no more in existence :/ > So Soulband, please give as proper answers, not just a crap, of how hard you are working on different skin patterns If you read the forums answers have been given. I understand that if a school discovers something, then it belongs to everyone and if I guild discovers something, then it belongs to the guild until the patent runs out. However, the Kinothian, the Kypiq school of alchemy, is solidly in Kypiq territory, so if they discover gunpowder, which is likely for them more than anyone else, would the technology only be given to the Kypiq kingdoms or would the share it with everyone? I understand that if a school discovers something, then it belongs to everyone and if I guild discovers something, then it belongs to the guild until the patent runs out. However, the Kinothian, the Kypiq school of alchemy, is solidly in Kypiq territory, so if they discover gunpowder, which is likely for them more than anyone else, would the technology only be given to the Kypiq kingdoms or would the share it with everyone? You will launch this game this year ? > >What am I doing outside of making dank memes for work? > >*What am I doing outside of making dank memes for work? * Ayy! Kaizen you seem really awesome! Glad to have you as part of the community. Final fantasy 6 IS better than 7. Was that ever a real debate to thoae of us who played it? Who didnt love terra going crazy and flying all around the world like a psychotic firefly? Very nice! Enjoyed this a lot! Greetings Kaizen! That journal added some happiness in my mediocre week. Keep the good work guys ! Nice journal Vye, things are looking great. Welcome Kaizen! The next Q&A, Tribes: Part II, will occur next Monday, June 19th, at 1PM PDT / 4PM EDT / 8PM GMT / 8PM UTC. We're currently getting the Kypiq, Janoa, and Dras dossiers written up, but questions about the Neran, Hrothi, and Brudvir are still welcome. Okay, we're doing a Q&A early Monday. It's currently Thursday night with no new dossiers. Nothing comes out over the weekend. So... are we getting all of them tomorrow? Posted By **Vye** at > The next Q&A, Tribes: Part II, will occur next Monday, June 19th, at 1PM PDT / 4PM EDT / 8PM GMT / 8PM UTC. We're currently getting the Kypiq, Janoa, and Dras dossiers written up, but questions about the Neran, Hrothi, and Brudvir are still welcome. > Okay, we're doing a Q&A early Monday. It's currently Thursday night with no new dossiers. Nothing comes out over the weekend. So... are we getting all of them tomorrow? I love how you say, "Come at me!" It's this kind of fearlessness that got us where we are today. Welcome to the CoE Movement. 6 and 7 were both great for their own reasons, but once you realize how much 7 actually took from 6, you have to give it to 6 hands down. This game is the closest I've found to a graphical reincarnation of Carrion Fields MUD - something I've trying to find for YEARS since I stopped playing. I was almost for sure you guys had played it when you mentioned making an ElyriaMUD, but either way, I'm super hype for this game. Definitely going to be pledging soon so I can get behind this early. Everything you guys are doing looks great. Keep it up! Really like the rough work on the UI, seeing some animals in motion is also a good sign of progress. Really like the rough work on the UI, seeing some animals in motion is also a good sign of progress. Keep up the good work! "...from entertaining GIFs (it’s pronounced Jif like the peanut butter btw)..."
It's pronounced GIF: like Graphical Interchange Format. "G" not "J", thank you very much! "...from entertaining GIFs (it’s pronounced Jif like the peanut butter btw)..." It's pronounced GIF: like Graphical Interchange Format. "G" not "J", thank you very much! Also, hajimamashite Taizen-San! Ganbate! This is fantastic stuff. Thanks for the update! >The Blue Penstemon and Astrantia Snow Star are beginning to bloom on the Steppe - and check out that updated grass! Can you tell us the name of the orange and purple flowers in the Dryas Elk preview? Do you know when we will get more information about the properties of these flowers? I'm assuming the purple ones in the Dryas Elk preview are from the Clover mentioned in the Biodiversity blog. But I would love to know more!! Also, Welcome to the Wonderful world of CoE Kaizen! Posted By **Vye** at > >*The Blue Penstemon and Astrantia Snow Star are beginning to bloom on the Steppe - and check out that updated grass! * > Oooo flowers!!! Can you tell us the name of the orange and purple flowers in the Dryas Elk preview? Do you know when we will get more information about the properties of these flowers? I'm assuming the purple ones in the Dryas Elk preview are from the Clover mentioned in the Biodiversity blog. But I would love to know more!! Also, Welcome to the Wonderful world of CoE Kaizen! "What’s a Community Producer, you ask? Chronicles of Elyria is going to tell a compelling story. The lore, the gameplay design, the art – all the facets of the game are interesting in their own way. Layer the growing community on top of a deep and engaging game, and now we’re cooking with fire. The way I see it, my job is to help tell that story – from entertaining GIFs (it’s pronounced Jif like the peanut butter btw) to developer diaries to gameplay sneak-peeks to dank memes to Twitch broadcasts to amplifying betrayal found in the Dance of Dynasties, I’m here to foster, facilitate and encourage conversation about CoE." Will Kaizen be "taking point" in keeping us updated on production news so Vye can spend more time in game development? Or is the Community Producer "amplifying betrayal found in the Dance of Dynasties" have a more direct role in primary game content/story production? I'm very intrigued and honestly unsure of whether to be impressed or nervous that the HR budget is taking on so much 'community' staffing. More importantly, what should VCs make of it? *"What’s a Community Producer, you ask? * *Chronicles of Elyria is going to tell a compelling story. The lore, the gameplay design, the art – all the facets of the game are interesting in their own way. Layer the growing community on top of a deep and engaging game, and now we’re cooking with fire. The way I see it, my job is to help tell that story – from entertaining GIFs (it’s pronounced Jif like the peanut butter btw) to developer diaries to gameplay sneak-peeks to dank memes to Twitch broadcasts to amplifying betrayal found in the Dance of Dynasties, I’m here to foster, facilitate and encourage conversation about CoE. "* I'm still confused! :) Will Kaizen be "taking point" in keeping us updated on production news so Vye can spend more time in game development? Or is the Community Producer "amplifying betrayal found in the Dance of Dynasties" have a more direct role in primary game content/story production? I'm very intrigued and honestly unsure of whether to be impressed or nervous that the HR budget is taking on so much 'community' staffing. More importantly, what should VCs make of it? I won't be "taking point" per se. Vye will still be doing production updates. You'll still read DJs from Caspian. I would like to start facilitating more community-centric content alongside Serp. I think this community is going to do awesome things, and I want to make sure you have an opportunity to do those awesome things. Thanks for the reply! I look forward to discovering what that turns out to be. Posted By **Kaizen** at 11:39 AM - Thu Jun 15 2017 > > I won't be "taking point" per se. Vye will still be doing production updates. You'll still read DJs from Caspian. I would like to start facilitating more community-centric content alongside Serp. I think this community is going to do awesome things, and I want to make sure you have an opportunity to do those awesome things. Thanks for the reply! I look forward to discovering what that turns out to be. The pterogin is... HUGE! Awesome!! Right?! The pteroguin is way bigger than I expected. And the Ursaphant is a lil bit smaller than I expected. It's so exciting to see these things becoming a bit more real every day! Side note - can't wait for my armoured war trison. Mm baby. Posted By **Arfen** at 10:31 AM - Thu Jun 15 2017 > > The pterogin is... HUGE! Awesome!! Right?! The pteroguin is way bigger than I expected. And the Ursaphant is a lil bit smaller than I expected. It's so exciting to see these things becoming a bit more real every day! Side note - can't wait for my armoured war trison. Mm baby. Welcome, Kaizen :) I'm sure you'll fit in amazingly. Watch out for aggressive roaming citrus fruits. FF IV for the win! Amazing journal! I can't wait wait for the next one. Thanks for this post. :) Welcome, Kaizen! :) I loved your introduction, specially the guitar ans the FF part. XD FF IV for the win! And please, yes! we need more gif of fauna and flora! There are lore scholars who are hungry of more info! Welcome Kaizen! And please, yes! we need more gif of fauna and flora! There are lore scholars who are hungry of more info! The Munsters are better than The Adams Family. Come at me. Great developer journal and welcome to the community Kaizen. Thanks for the developer journal, always a pleasure =). Awesome, I always look forward to the next development journal. Superb post. These are the kind of updates I enjoy. Also welcome to the team brother! Superb post. These are the kind of updates I enjoy. Also welcome to the team brother! So much good stuff in this post! I'm really looking forward to the transition from back-end work to front-end so I'm glad to hear that's happening. I also greatly appreciate your including a tidbit on Adam "Kaizen" it's good to know a little about the people with whom we'll be interacting. Finally, I love the attention to detail that we see over and over in the game development. The example in this post are the three layers that make up the ground, essentially. Three layers! For the ground! Granted we'll see it a lot but still, there are so many details in so many mechanics of the game and they really seem to be coming together; like the sliding which sounds pretty cool, too. So much good stuff in this post! I'm really looking forward to the transition from back-end work to front-end so I'm glad to hear that's happening. I also greatly appreciate your including a tidbit on Adam "Kaizen" it's good to know a little about the people with whom we'll be interacting. Finally, I love the attention to detail that we see over and over in the game development. The example in this post are the three layers that make up the ground, essentially. Three layers! For the ground! Granted we'll see it a lot but still, there are so many details in so many mechanics of the game and they really seem to be coming together; like the sliding which sounds pretty cool, too. Which tribe did you use as the reference on that animal size chart? Yoru? Neran? Welcome to the community. Now, it's graphics interchange format. Please tell me how you get a J sound from the word graphics? Sorry but I had to ask as you called it out. And your right 6 is better but 7 will always have a special place in the FF community. Also the shrug emoji decided not to show up today so, sorry about that. The article says you will amplify the dance of dynasties; will that mean you will be the literal pot stirrer? Posted By **Kaizen** at 05:19 AM - Thu Jun 15 2017 > > Also the shrug emoji decided not to show up today so, sorry about that. The article says you will amplify the dance of dynasties; will that mean you will be the literal pot stirrer? Why is it that every other company can cross post Twitch videos with Youtube and maintain the Twitch video, yet SbS can not? What would he do if we just left in disgust? I've been thinking about a response for about five minutes and I guess that's what I would do? Just sit here and think? I agree that FF6 is the superior game, but I would be lying If I didn't admit to squeeing when the FF7 remake was announced. My favorite RPG of all time is Chrono Trigger, I used to rent it every weekend from the local video store (they eventually gave it to me). Welcome Kaizen, looking forward to seeing the fruits of your labor. Always loved that ending, my favorite has to be this one though: https://youtu.be/5Mawzm3I3TA the ending itself is awesome, but the whole process of figuring out how to get to the final battle so quickly let alone winning it..... mmmmmmmm right in the feels. Kaizen played the Titan on Destiny? He's alright! Oi! What is that second biggest creature? That griffon/bird like thing, will it eat my brains with that beak? It's the combination of a penguin and a bat I forgot what the exact name is, but it's in one of the DJ's. Posted By **DoctorFaust** at 9:55 PM - Wed Jun 14 2017 > > Oi! What is that second biggest creature? That griffon/bird like thing, will it eat my brains with that beak? It's the combination of a penguin and a bat I forgot what the exact name is, but it's in one of the DJ's. It's a cross between a Penguin and a Pterodactyl. Posted By **Norvol** at 1:23 PM - Thu Jun 15 2017 > > Posted By **DoctorFaust** at 9:55 PM - Wed Jun 14 2017 > > > > > Oi! What is that second biggest creature? That griffon/bird like thing, will it eat my brains with that beak? > > It's the combination of a penguin and a bat I forgot what the exact name is, but it's in one of the DJ's. It's a cross between a Penguin and a Pterodactyl. It's absolutely a Pteroguin. ;) A group of them is a terror, enjoy the friendly skys. I agree, FF6 is far better than FF7. Finally someone that gets me . @Kaizen Thank you for being someone who understands, i'm sick of these plebs that think FF6 is a bad game, like it's the best of the FF games i've played.